The rear shell of what appears to be an upcoming Nokia device has appeared online. The manufacturer behind Nokia devices, HMD Global, recently confirmed it would be holding an event in Russia on May 29 where it is expected to announce a number of new devices. Currently, it’s unconfirmed which smartphones will be making an official appearance but a newly-leaked rear panel hints at one possible release. Taking a look at the image, the panel itself appears to be made from a hard plastic, suggesting the device it belongs to sits on the lower-end of the pricing spectrum. Now, at the event, there are two likely launch candidates, the first being a successor to last year’s Nokia 5. 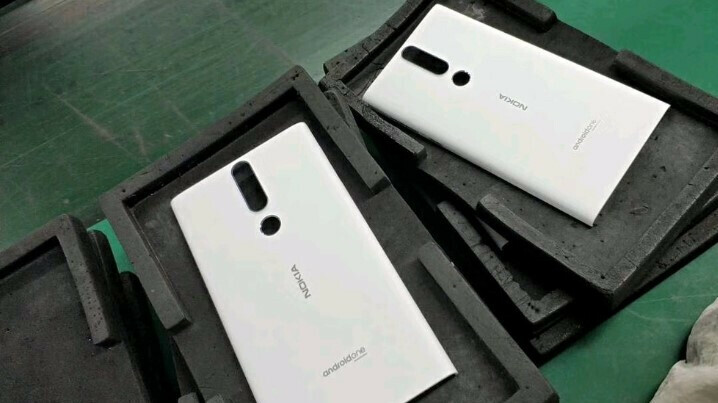 When it comes to the rear shell in question, however, this could belong to the other launch candidate, the 2018 edition of the Nokia 3. This is due to the rectangular shape of the panel. After all, the rear panel featured on last year’s Nokia 5 was much more rounded and also curved over on every side. The Nokia 3, on the other hand, boasted a more rectangular shape and less pronounced curves on the rear, thus matching up with the overall design of the new panel. Although the Nokia 3 looks set to sport a similar shape, the rear panel reveals at least a few planned design changes. First of all, the camera module will sport a new, elongated design that continues the trend seen on recent Nokia smartphones. Additionally, the plastic shell also sports a circular cutout for what is presumably a rear-facing fingerprint scanner. It’s unclear why Nokia may have moved the sensor over to the rear of the device but considering the tall display panel featured on the recently-announced Nokia X6, it’s possible that the upcoming Nokia 3 (2018) will also feature a taller aspect ratio, thus forcing them to move the sensor. On one final note, Android One branding is clearly present towards the bottom of the panel, confirming that the new device will be the brand's latest to join Google's program. If this panel does indeed belong to the new Nokia 3, fans of the brand can expect the device to make an official appearance on May 29 alongside the updated Nokia 5. Additionally, HMD Global may launch the Nokia X5 and X7 that are rumored to sport the same design philosophy debuted on the Nokia X6. Looks like a N9.......one of the best phone Nokia ever made! The best phone Nokia ever made was none other than... The Nokia 3310. I'm starting to doubt your enthusiasm for cellphones, mate. I swear, I wish HMD could revive that phone with meego. It still has lot of potential. Show me Nokia 5 specs leak or N series leaks i shall feast my eyes on that. Who’s going to release more phones, Lenovo/Moto or Nokia? None...samsung and xiaomi are the undisputed leader on making countless models!! You forgot to add Huawei to that list.